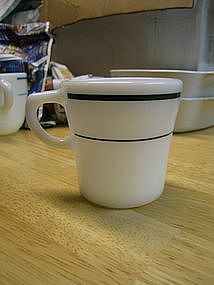 6 ounce restaurant mug/cup marked as Pyrex Tableworks 13 by Corning. No chips, crack, breaks, roughness or damage to the green band. 2 mugs with the green band are available and priced individually. I need your zip code to calculate the postage.